I was at the FTI Saturday market this morning and ran across these miniature looking “gabi” or taro corms (technically not roots) and was, of course, intrigued. When asked, my suki for ingredients from the Ilocos region said they were used in sinigang, to make the broth thicker, almost stew-like. She made sure I understood that this type of small “gabi” were far superior to other types… Of course I believed her and bought some, maybe 1/4th kilo or so worth. 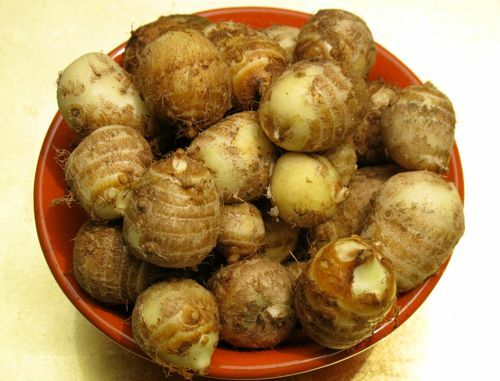 A little googling and checking of my Davidson tome on ingredients suggests these might be what the Japanese call “eddo” or the smaller variety of taro. They are similar to larger taro but the flavor is said to be more refined, sometimes a tad sweet, and still high in starch/carbohydrates. I was quite excited to find these mini gabi corms as Mrs. MM had recently ordered a Kurubota pork sinigang at Mamou that was simply delicious and I have been meaning to see if we can do something similar at home! The broth of Mamou’s sinigang was so thick, it was practically like light gravy. Hard to describe but extremely appetizing. Marketman’s gabi sinigang recipe, up next. Gabi is always an ingredient in our family’s sinigang, especially pork and beef. For me, sinigang is incomplete without the gabi, especially the small ones as pictured in your post. We love taro in sinigang. I always buy them from my Ilocano suki since he sells the langkitan ones. I also use them in nilagang spareribs. great!!! I like the small gabi than the larger ones for sinigang. In fact, I have these right now in the crisper. Both are available here in Singapore groceries. They even have peeled ones and vacuum packed for one’s convenience. MM, we call this pitik na gabi in the north, best to use if you want a thick broth…not starchy thick but mucin thick…uu…mouthwatering. I love taro smoothie with sago…. Is this the same gabi that is boiled and dipped into sugar and eaten as a snack? You’re right, Anna. Much as I prefer the big gabi, my husband, who is from Bulacan, says these small ones are THE gabi for sinigang! WOW!! sinigang with lots of gabi !!! yummy. when i was young,every sunday we have sinigang na baka / baboy at my lola’s house. almost all of us love the gabi. we mash it on our rice, add some soup, mix season with patis with sili. Panalo!!!! Somoene once asked me at Church why her lumpia bursts and is not crispy even after it stands. …I didn’t get the chance to elaborate on what I use. I know she follows your blog and I misplaced her phone no…here it is , Ms. K…above is what I do for my lumpia shanghai. Anna – Ditto, from a fellow Bulakena! Betty Q – A Chinese cook taught me that “slapping” technique. Absolutely works! Nakakagutom naman MM!! Makes me think I will cook sinigang for Sunday lunch with lots of gabi. That’s a neat and healthier take on lumpiang shanghai from Betty Q – will try that too. Thanks as always for sharing your finds. Yeah, we used this gabi for beef/pork sinigang—makes the broth thick. Thank you Betty Q for that tip!Will try that next time I make Lumpia shanghai. i also found out that adding gabi corms to my laing makes it sooo rich! Sorry, I’m still an amateur in doing these dishes that I’m also still discovering things—thanks to your blog, MM! BettyQ, you’re such a sweetheart! Thank you for the tip! Is this the gabi that gives you the itches when you’re peeling it and the more you scratch the more the itches spread? MM,looking forward to yr sinigang recipe. Thanks for the tip Bettyq! Betty Q, at the risk of sounding stupid, do you cook the gabi before you grate it? This type of gabi is called edo and is always found in our groceries here in Toronto. I use this when I cook my sinigang and ginataan (binignit) and it’s really good! This is the gabi I grew up eating with my sinigang, so now I prepare mine the same way. I used to love mashing up a tiny gabi into my rice mixed with a little sinigang broth to thicken the mixture–in fact, I still enjoy it this way. i don’t think this is the same gabi that is featured in the links to laing ang takway although it may be included in ginataan. this kind comes from a vine, hence more related to ube. boiled, it is a standard accompaninent to lechon in leyte to cut the unctuous richness of pork. in tagalog, both go by the name “gabi.” in ilongo, the one posted here is “gabi,” but the other one is called “gutaw.” tell-tale differences: the small upper section of the “gabi” where it was attached to the vine is markedly softer when cooked; this section is also rounded unlike that of gutaw which is flat, a result of the sharp knife cut needed to separate it from the stalk (petiole?). 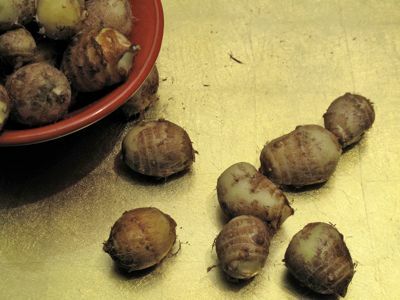 to make matters more confusing, “takway” is runners from “abalong,” whose leaves are paler green than those of “gutaw.” Abalong does not develop rubers or corms. here in davao, my MIL uses “karlang” (sp?) in our sinigang.. is this the same? of sinigang pork, hipon or beef…saraaap! I’m looking forward to your sinigang recipe… my bf once told me that his family makes sinigang with a thick broth using gabi and it’s really delicious and hearty. Kakusina…it works a lot better if you grate it RAW as you need that slimy thingey ! ,,,once it is boiled, the gabi no longer has that slime. Another thing…if you are going to make HUNDREDS of lumpia , the task of rolling it will be a BREEZE if you use a piping bag…disposable plastic ones works best. My family likes pa naman the baby lumpia about only 3 inches long!…have your lumpia wrapper …the small ones lined up like an assembly line and pipe away! Alsp, if you are going to freeze them….line them up SINGLE LAYER on wax paper lined cookie sheet and freeze them. Once frozen, you can pack them in zip plock bags and freeze. Don’t forget to SLAPthat mixture against the sides of the bowl . It has to look and feel pasty…a good way to get your frustrations or stresses out by slapping that mixture against the sides of the bowl! Then, let it sit overnight in the fridge to hold the mixture togther and the flavours to mellow…..mas masarap! Next day, roll away! I am making the assumption that the grated “Baby Gabi” is added raw to your Lumpiang Shanghai? Right? I also add eggs and have the same propblem. I will try this secret of yours asap. Btw, do you have a “tip” to keep the wrapper of the Lumpiang Shanghai” from losing its crispiness while it sits on the table at a buffet? In Tabaco (a Bicol city) we call this “linsa”. The gabi root, we call “tangoy”. Pinky Rose: My apologies for whenever I bring lumpia to gatherings, it gets eaten right away and I get this reklamos that I didn’t bring enough! Ako pa ang may kasalanan!…mwahahaha! If the party is over at your house, what I can suggest and is often what I do when the party is over at our house….I fry the lumpia BUT not at all golden browned.The wrapper is a few seconds away from getting to that color. it is still pale though the filling is already cooked. This is only if I have to fry HUNDREDS! Then when I see that the container is down to a dozen or so, I have the deep fryer on and then fry a few more till golden brown. It will take only a few seconds more. This is the same thing when those French Fries places have to do…it is called blanching then they fry it again to golden crispness! This way, it is nice and still hot and crisp when the people eat them. Hope this helps! Thanks bettyq for the explanation. Thanks MM for sparking off another great exchange among MM readers. betty q: Wow! That is something new :) I will try that. I like the mini gabi too, but it is a pain to peel, especially since, I think I am allergic to it’s “dagta”, my hands becomes red with itchy rashes if I forget to wear gloves while handling it. This is actually the “gabi” or taro we have available here in the US. I never saw the big ones we have in the Philippines. These are quite pricey too so I use only a little to flavor my guinataan halo halo unlike in the Philippines where I can splurge on these. Oops, stupid me. If I had read this post instead of going straight to the Sinigang post, then I would have figured out the substitution…or the fact that gabi is, in fact, taro root which is readily available here. I will try this next time your goddaughter, Ms. Chomp Chomp, is home from college since she’s developed such a taste for Filipino cuisine ever since she joined Club Filipino and got in touch with her roots…the Asian ones anyway. The Italian ones were already highly developed. Thanks! Hahahaha this is funny, I just bought some Japanese taro and some Japanese sweet potato last night at 99 Ranch. I could use some shrimp and bangus sinigang right now (just not pork, until they make it kosher hehehe), yumm! I only have seen those on occassions. I have to get some next time I see them. I’m not sure but are those gabi tagalog sold in the supermarkets? Usually they are really brown almost black, many still crusted with soil. Those in the pics above look already cleaned. It is quite common in Rustan’s fresh and SM hypermart. I too love to mash it up with some rice and add a few drops of toyo with some sinigang broth, almost like a savory brown suman. There are two other varieties I have seen, one looks almost like ube because they are bigger, darker. and hairier and the other almost like the ones pictured above, clean and usually part of the stalk is left on the top. try the taro with adobo baboy. we chinese cook that way. delicous!! Talaga ka, ang gabi na gani to ay talagang masarap sa sinigang, works as a thickening agent. We also boil it at sawsaw sa sugar pang minindal. 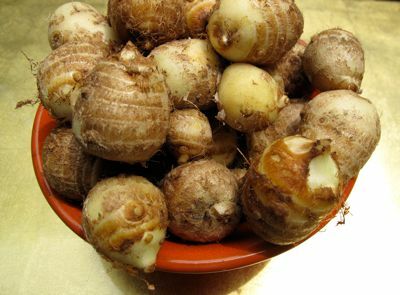 There is a root crop that we use to enjoy growing up in Quezon, kasama ng gabi, it is called tuge (pronounced as) that I can never find. Longish with a few bumps, tapos ang texture na laman nya is soft. Masarap din sawsaw sa sugar…I guess it was discovered during the war, kasi everytime kumakain kami noon, eh my lola recounts how hard life was during the war. masarap ito bulanglang style na may kahalong paayap at bawang na mura! paborito ng lolo ko ang gabing ito! Who would care for purplish gabi from mindanao? it is sticky and great. how much would one pay for a kilo? The price for a kilo is important so that I can know if it is worth bringing so many kilos. I bought some planting materials of 11 kilos, fit for my cebu pacific baggage allowance going from gensan to manila. I learned it takes 8 months to have a mature gabi. I plan to plant them in bataan.